Since I lived in Madrid for a year I consider Spain as my second home. I absolutely love exploring its delicious food, siesta way of life, gorgeous cities and towns, rich culture and amazing nature. 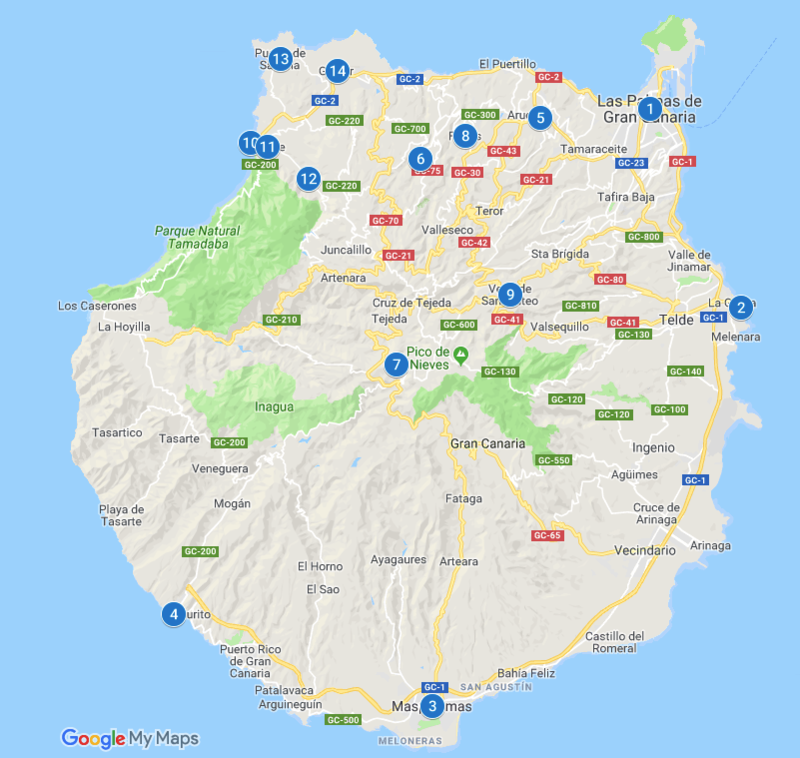 So far I have visited 12 out of 17 (+2 cities) Spanish autonomous communities, so when I got the chance to visit Canary Islands for the first time I was thrilled. Canary Islands lie in the middle of Atlantic ocean, 100 kilometers west of Morocco. They consist of seven main islands and many more smaller islands, isletas and rocks. 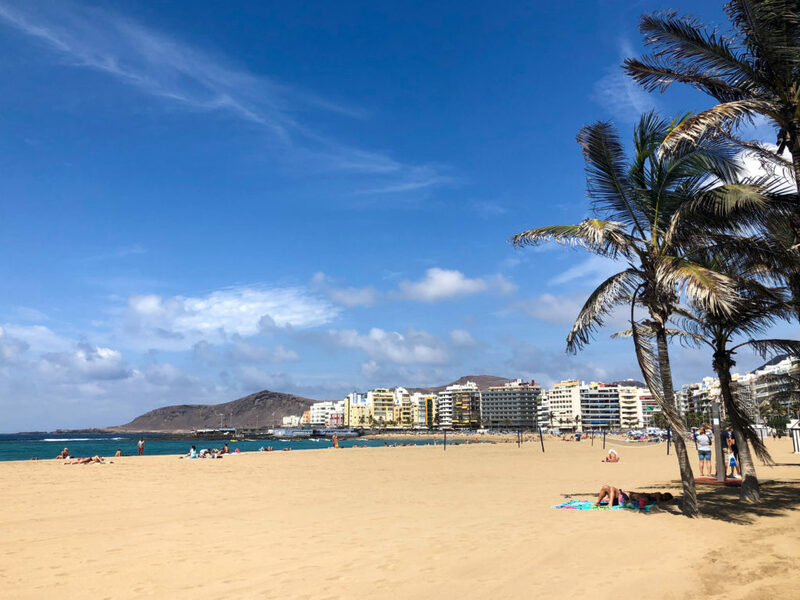 I spend an incredible week on Gran Canaria, the third largest island but having the biggest city Las Palmas de Gran Canaria. It was a perfect vacation, filled with relaxing beach time (we had surprisingly hot weather and I visited in October) and exploring of all the best sites on the island. Let’s check out which places we visited. 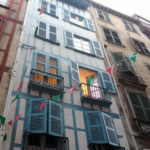 The main city on the island offers rich historical sites, amazing beaches and shopping. 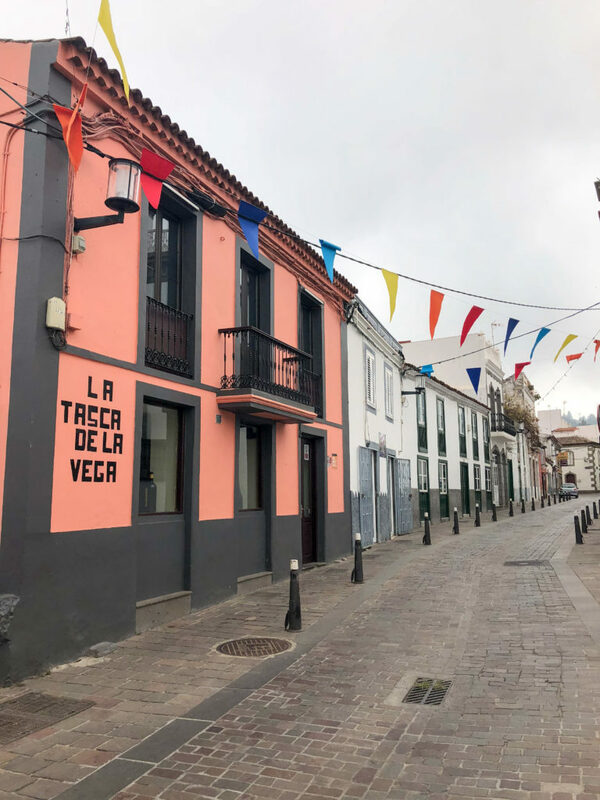 You have to visit old town Vegueta with Plaza & Catedral Santa Ana, museum Museo Canario and Cristobal Colon’s amazing residence on the island Casa de Colon, eat tons of tapas and get lost in the colourful streets. 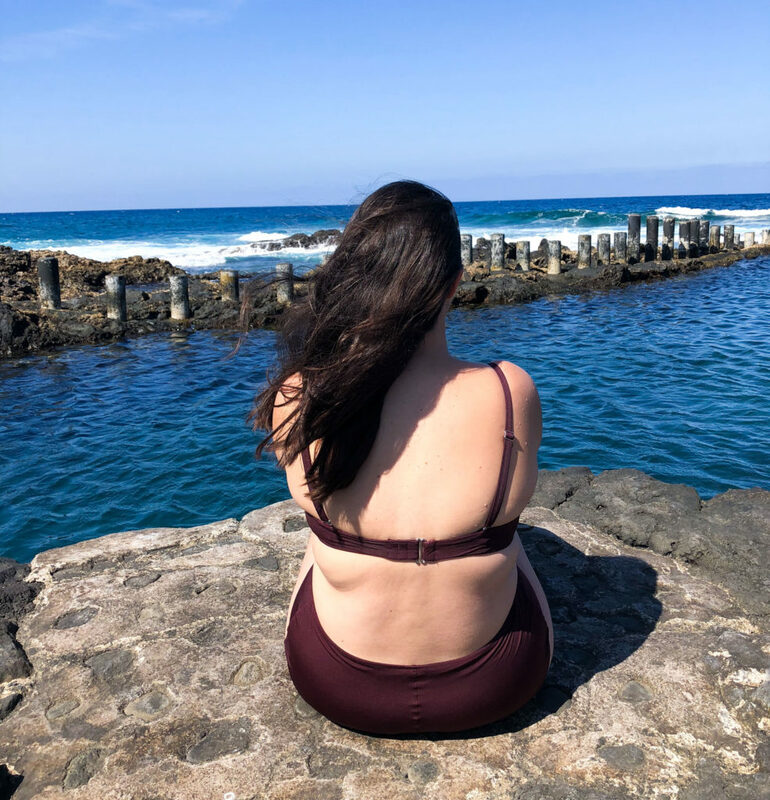 Go to the beach and swim in refreshing Atlantic Ocean, my favorite was Playa Las Canteras, and visit Playa de El Confital for a beautiful sunset. Las Palmas de Gran Canaria as the biggest city on the islands also has many shopping sites and the biggest port. Ride up to Mirador Del Cardón for an overview of the city. 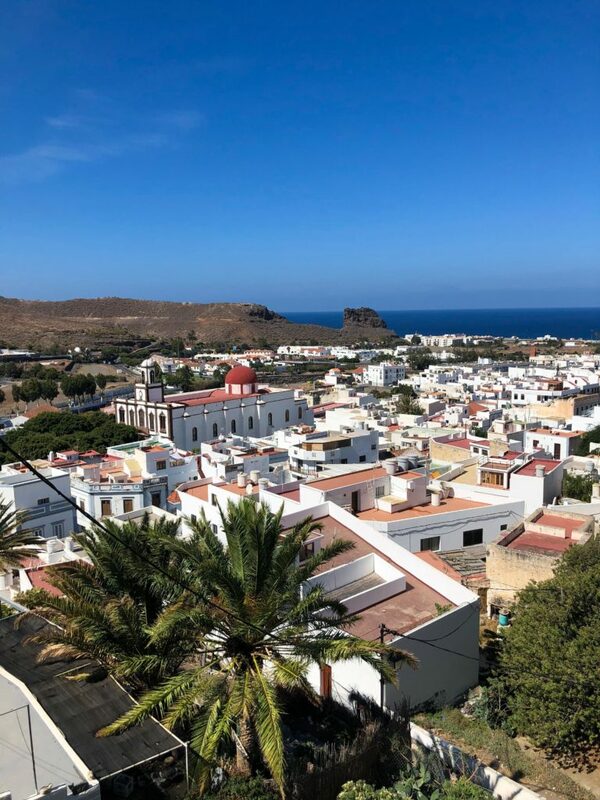 You can find one of the hidden gems of Gran Canaria in Telde. It’s the home of El Bufadero de la Garita; a blowhole on the seaside promenade. El Bufadero consists of two large cavities in the rocks, which are being filled with ocean water at a high speed. Once the rocks are full, they spit the water and make an interesting sound. It’s a nice site to sit and admire this type of geological formation. Who doesn’t love sand dunes? And the ones in Maspalomas magically end into Atlantic Ocean. They cover an area of 400 hectares and have been a protected natural reserve since 1897. There is also lagoon La Charca, which is a heaven for birdwatchers. 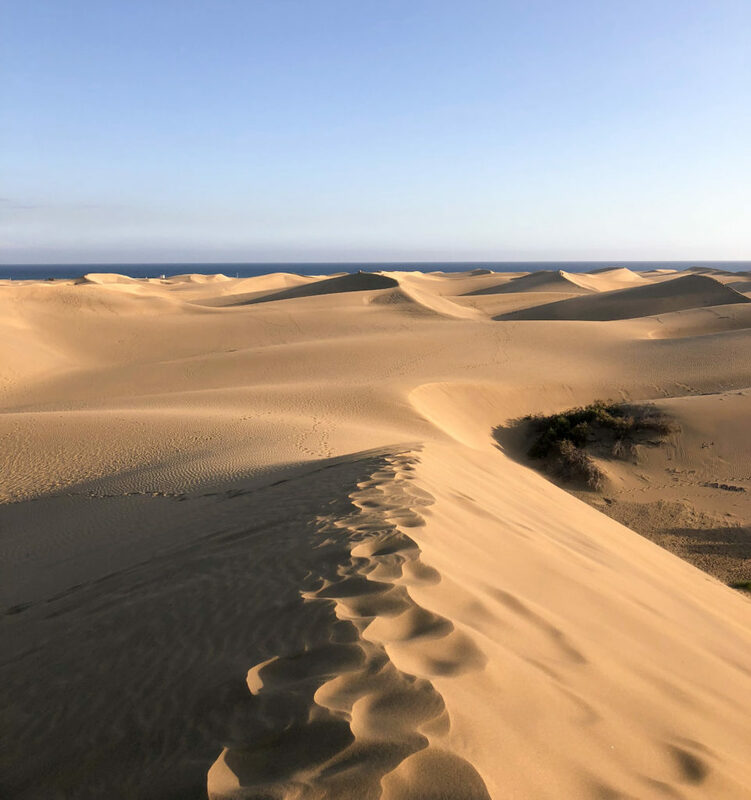 Maspalomas is otherwise a town with tourist resorts, nice promenade with an old Lighthouse and beautiful Maspalomas Beach. One of my favourite places on Gran Canaria! Puerto de Mogán is a picturesque fishing village with white houses, green windows and colourful decorations on buildings. There is a nice port, sandy beach and the town is also known as the Venice of the Canarias, as there is a canal that goes through the city. For me it’s a perfect place to eat some ice cream and drink sangria. Arucas is mostly known for being home of the Arehucas rum company. However, beside compulsory visit to the factory to learn everything about rum production and try different delicious sorts of rum, it’s worth visiting the city center. Take time to admire majestic Church of San Juan Bautista, marvel at cute colourful houses, find shade in the municipality’s park and even maybe drive up the hill to La Montaña de Arucas Viewpoint for a nice view of Arucas and surrounding areas. 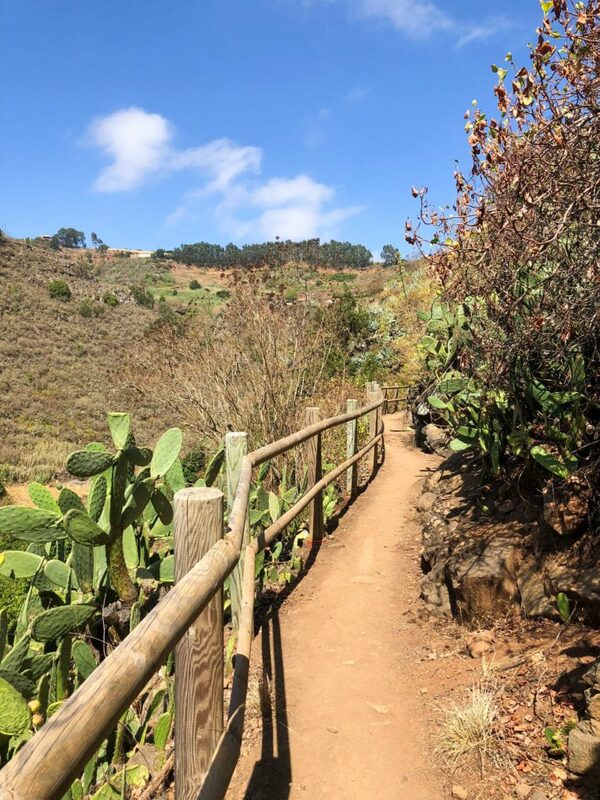 The northern part of Gran Canaria is pretty green and a great place to see different flora of the island is a natural reserve Los Tilos de Moya. There is a circular hike around the forest worth taking an hour to hike, however, you can also take longer hiking trails. What is interesting about Gran Canaria is how this small island has really high peaks. 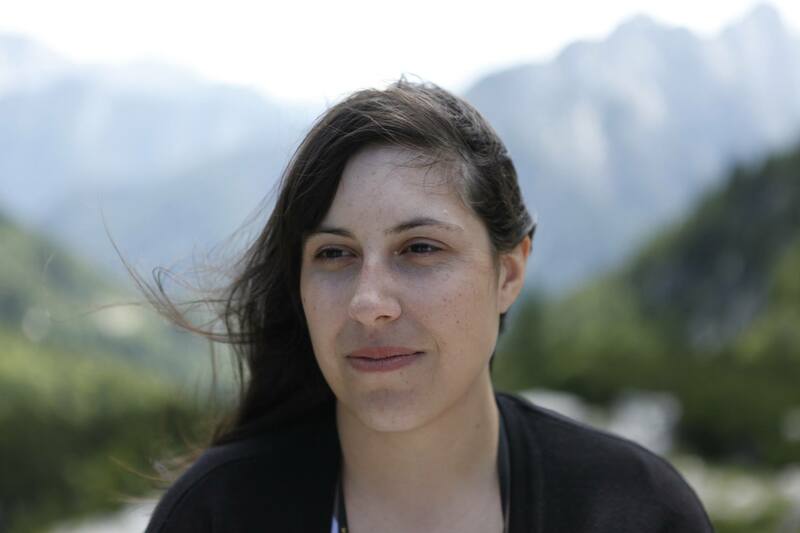 The highest is Pico de las Nieves with 1949 meters of altitude. 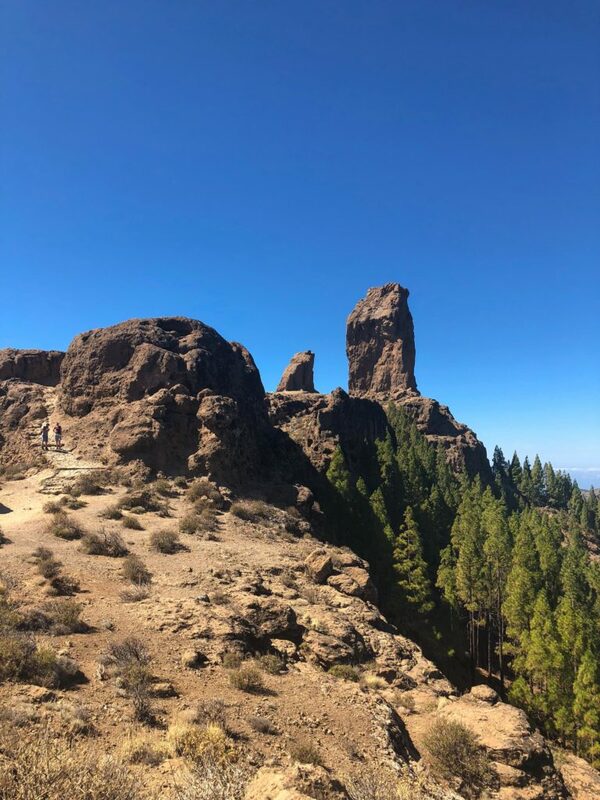 However, the most popular with tourist is Roque Nublo with 1813 meter of altitude, consisting of two unique volcanic rock formations – 80 meters high basalt finger and a rock in a shape of a frog. There is a short hike to the top, offering a view of the central Gran Canaria. 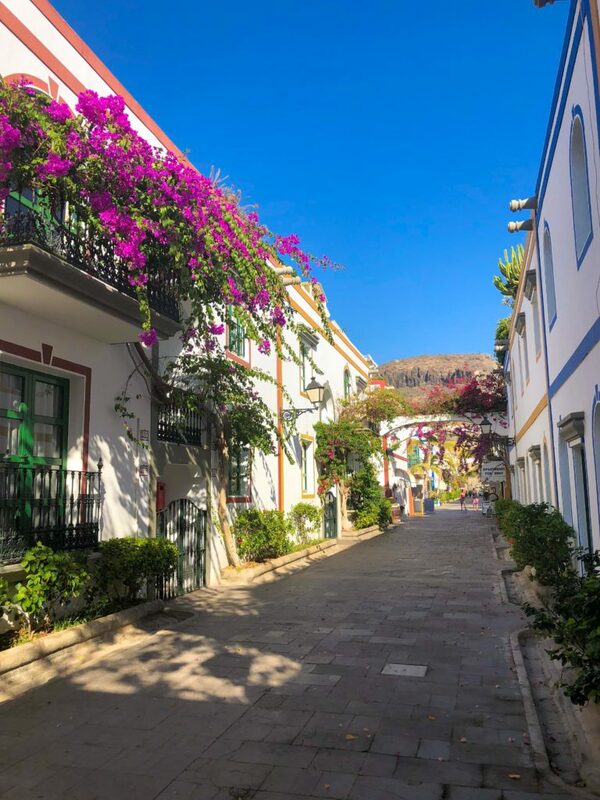 This cute small town in the north part of Gran Canaria is full of charm. Its history has been connected with water and today they mark their heritage with a 30 meters long artificial waterfall that flows down the steps of Paseo de Gran Canaria in the center of the town. 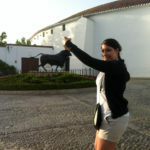 It is also worth to check out surrounding streets, San Roque church and square, the old water canals and the water mill. Firgas also offers an incredible view of the north part of island, in nice weather you can see all the way to the Atlantic Ocean. An agricultural center Vega de San Mateo is most known for holding a large cattle and agricultural market every weekend. However if you visit during the week, as we did, stop for some sweets in old traditional pastry shop Dulcería San Mateo, walk around the town center and visit San Mateo church. Puerto de las Nieves is a little fishing village on the north-western part of the island where ferries depart for Tenerife. 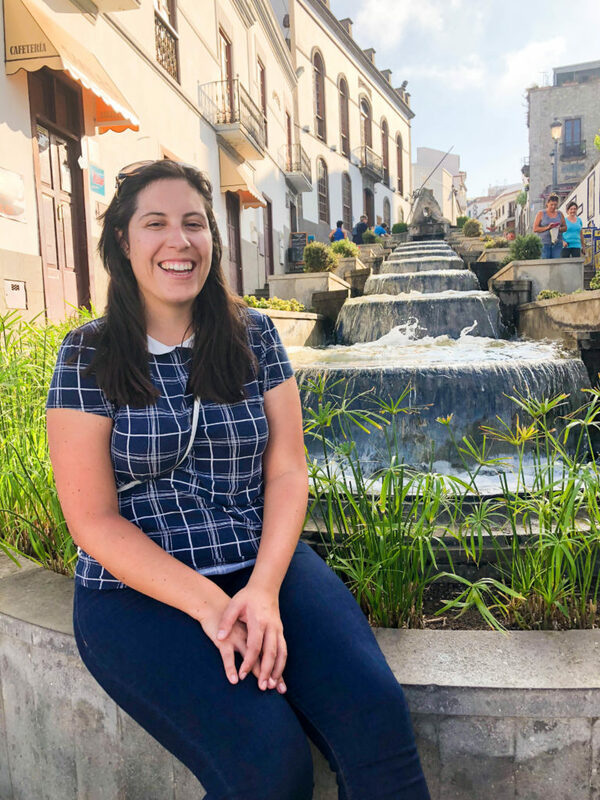 You can take a stroll along the village, vistit church, but the best part of the village is Las Salinas – an old salterns that were changed into semi-natural pools, filled with seawater from the Atlantic Ocean. A gorgeous place for a swim! You will pass the white houses and cute narrow streets of Agaete on the way to the fertile Agaete valley. 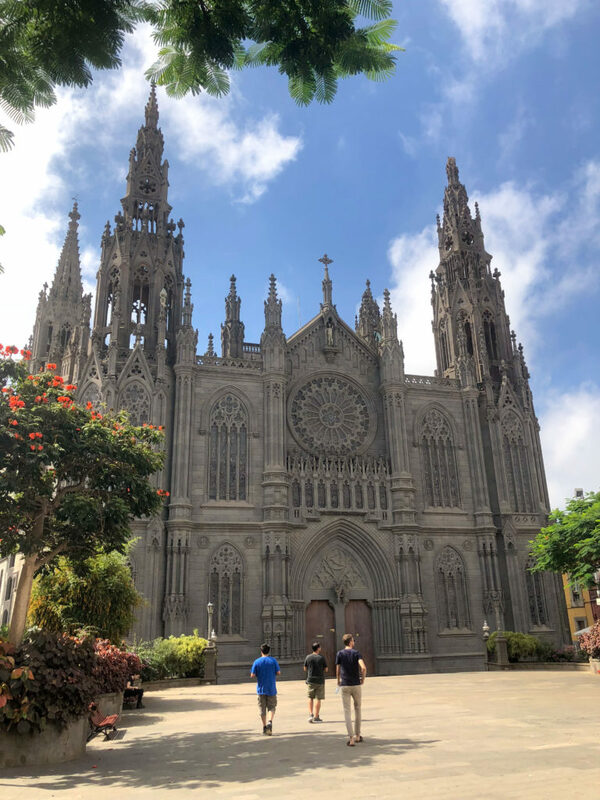 Stop to admire the main square with the Church of Conception and before exiting the city take time to enjoy the view of white city and the Atlantic Ocean behind it. The town that has it all – coffee plantations (Did you know that Canary Islands are the only place in Europe where coffee grows? ), vineyards and orchards with tropical fruits. 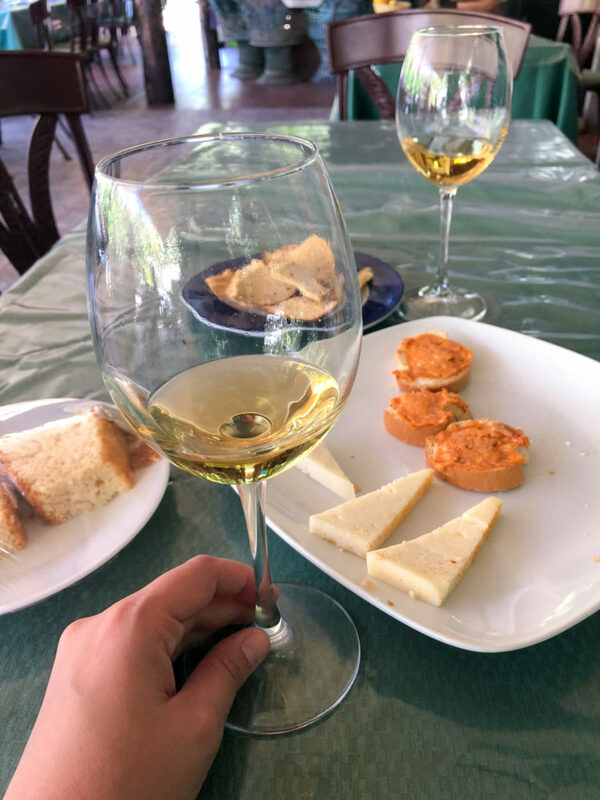 We visited Finca La Laja and got to know how the Canarian coffee, wine and fruits are grown and processed. We also tried coffee, cake, different wine, tapas, grapes and their volcanic water. 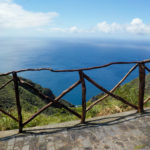 And they have the best view over Agaete valley. Another little fishing village with golden sand beach and colourful houses. 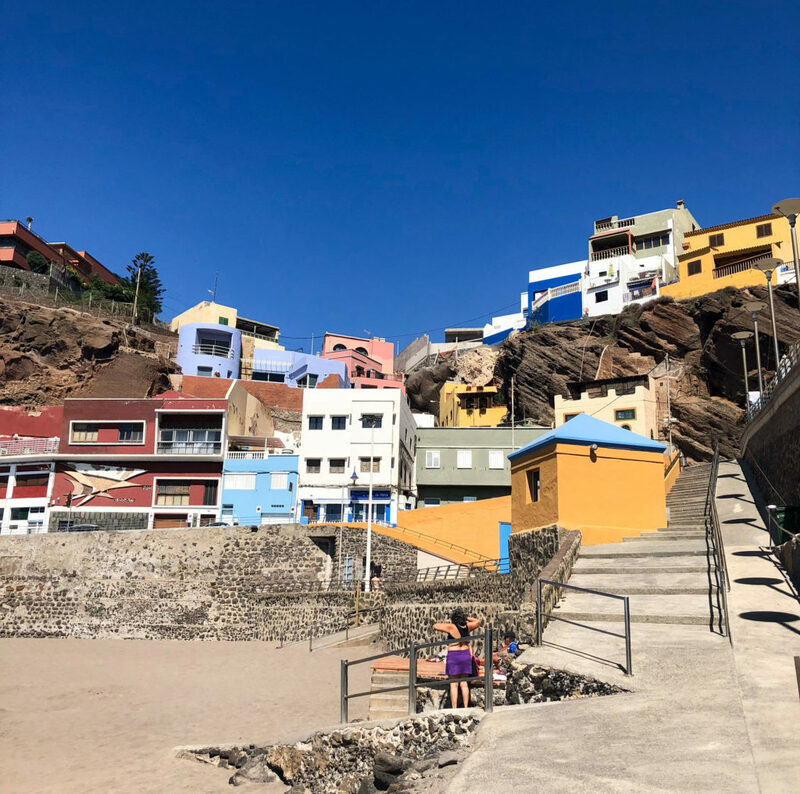 There is not much to see in Puerto de Sarina, but you can stop there for a swim and some sea food. Do also drive to the lighthouse La Faro de Sardina, with good weather you will be able to see all the way to El Teide on Tenerife. We visited Gáldar to see the famous painted cave La Cueva Pintada and the pre-Hispanic archeological site surrounding the cave. The latter is an excellent example of art of the ancient natives. Although there are a few beliefs what the painting represent, the most probable theory is that it’s kind of calendar. 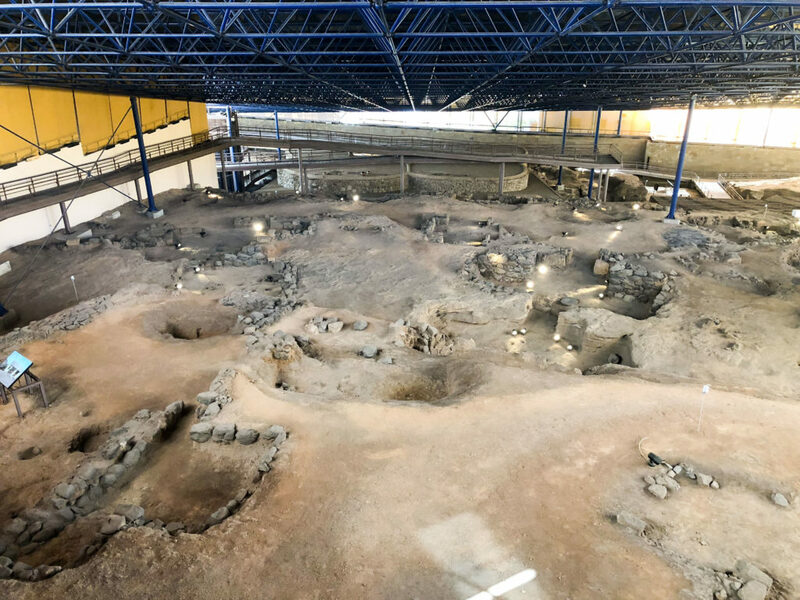 Around the cave there are reminds of the houses and settlement, the museum on the site also offers interesting explanation of the pre-Hispanic civilizations that lived here. While visiting don’t forget to take time to stroll Gáldar’s colourful streets. I wish I will be visiting the Canarian Islands soon. Your’s post only encourages me with this decision.